To skip the lecture, and go straight to the list, click here. One of my earliest memories is of watching my father turn the compost pile. The sight of the teeming life within the pile, and the warmth and rich scents it gave off, are still so clear to me that I feel like I could reach out into that memory, and pull myself through, shedding over a half-century of years and return to that happy summer day. I learned organic gardening from my father, and have practiced it to this day. A few years ago, when visiting my father, I noticed some weed killer in the garage - a strange and unexpected sight, and I did not realize at the time that it was one of the first signs of the Alzheimer's that finally killed him. So it was only madness that brought him to put poison on his land, and this pointed out to me again the madness of industrial agriculture. There are now 7 billion people in the world, and all of us need to eat. Can this number of people be fed by organic agriculture? Without fossil-fuel mined phosphates, without fossil-fuel fixed nitrogen? Without fossil-fuel driven tractors to till, and trucks to take the food to people? Maybe. We don't know. It would take a massive, worldwide reorganization of human society to achieve this. When the oil runs out, we, or our descendents, will find out. Until that time, we support an orderly move towards a more sustainable, more regenerative agriculture. Theoretically, we have the knowledge and the technology to make this transition with minimal suffering, but we feel it is unlikely that humanity will choose to take the steps necessary to create a viable future. Currently, our species is on a path that seems destined to create a future of the maximum possible human suffering. While we use organic methods ourselves, and we fully support organic agriculture, we must object to the "organic seed requirement" of current law. This requires organic growers to plant only organically-grown seed, otherwise their crop will not be considered "organic." Most people do not realize that this requirement was inserted into the law at the request of a large corporate seed company in one of their attempts to gain control of the organic seed market, or that many in industrial agriculture support the organic seed requirement because it will be an additional burden on organic farmers, which will lessen their economic viability. There are currently some exemptions to the organic requirement, but again, the corporations are pressing for and "end to the loopholes", and claim that no matter what the cost of organic seed, or no matter how limited the selection of organic varieties, that this is no excuse for organic growers to fail to buy their product. We are also seeing serious profiteering by a few organic seed suppliers at the expense of their fellow organic growers, with some organic seed selling for ten times or more the cost of conventional seed. There is absolutely no excuse for this - NO organic seed is worth TEN times its conventional counterpart. While we fully support the move towards the organic production of seed, we do not believe that there is any solid evidence that organic crops grown from conventional seed are any different from those grown from organic seed. In over thirty years distributing seeds, we have seen excellent organic seed as well as excellent conventional seed, and poor organic and poor conventional seed. We do believe that organically-grown crops are superior in many ways to those grown by industrial agriculture. We do believe that when seeds are grown organically for many generations, that particular strain will be better-adapted to organic production, but I doubt that anything under ten years will be significantly better. The key to the quality of seed lies in the DNA - the genetic content of the seed, and only secondarily from the conditions of production, harvest, drying, and storage. Without good DNA, no matter what the conditions of production, the seed will not be worthwhile to plant. For example, wild-collected seed is not considered to be "organic". If a grower wants to produce an organic crop of a medicinal plant, and that seed is available as certified organic, under current rules she must use the organic seed, and cannot use the wild-collected seed. Wild populations of medicinal plants may vary considerably in the specific medicinal properties, or in adaptation to specific local conditions, and several organic growers have expressed concern that some medicinal crops in cultivation are in serious need of the greater genetic diversity that would come from an infusion of wild genes from wild plants. Under current rules, plants grown from wild seed could never enter the organic market. This is causing the same kind of genetic uniformity seen in conventional agriculture, which is contrary to organic principles of diversity. Also, many traditional vegetable varieties vary considerably - some growers are careful about reselection for superior traits, others are not. If a specific variety is available as "organic", an organic grower would be required to use the seed, regardless of quality. We support organic agriculture, and we also support small-scale, family farms. Should we purchase "organic" seed produced by a large corporation, or seed from a struggling small farm who does not happen to have organic certification? What would you do? We believe that organic growers need the freedom to plant the best seeds and the best varieties they can find, regardless of how they were produced. We feel that the dangers of the loss of genetic variation in our food crops by the limitation of available variety, and the consolidation of control of seeds by corporate interests, currently far outweigh the advantages of "organic seed". When we have spoken about our concerns with organic growers, most have heartily agreed with our views, but a few have taken a very fundamentalist hard-line that "We support 'organic' no matter what!" and that organic seeds should be required no matter what other harm this causes. We would suggest that it would make more sense for these organic purists to also require that organic growers may not use plastic irrigation pipe (a major source of toxins), or any fossil fuel or electricity (sources of environmental harm) in their operations or when transporting their product to market. Should we require that organic growers use only human and animal power to plow and ox-carts to carry their produce to market? The "agri-smog" of pesticides from California's agricultural Central Valley is killing frogs far downwind, high in the Sierra Nevada. Can any grower downwind of this kind of agriculture be considered truly "organic"? We would like to point out, that while we fully support organic agriculture, we do not support fundamentalism, irrationality, or superstition, and we certainly do not support profiteering or corporate attempts to control organic seed supplies. We are opposed to making organic agriculture into a fundamentalist religion, and we are opposed to the theft of the word "organic" by government bureaucracy, and we are opposed to the corporate takeover of the "organic movement". "Wait a decade or two and every potato coming out of the state of Idaho will be labeled 'organic', a word already under very serious stress. The process will be entirely predictable. The big food companies will buy federal and state legislation designed to put the small producers out of business, the same way the meat companies finished off the small packers and processors years ago, by insisting on hundreds of thousands of dollars worth of stainless steel and other 'sanitary' equipment, all intended to bankrupt the local sausage or ham maker. Wall-Mart's buying power will drive down organic food prices and start to drive small farmers to the wall." —Alexander Cockburn, "Wall-Mart's Coming Lunge into Organic Food", an article on the corporate takeover of organic and the weakening of organic standards. We need to build bridges, not walls. Instead of a black/white - organic/conventional standoff, with the small-scale grower caught in the cross-fire, we need to provide for a whole range of possibilities that will allow farmers to easily move along a spectrum of alternatives towards a healthy agriculture, rather than building a wall they must vault over. MALVACEAE. Tall, showy, free-flowering annuals biennials and perennials grown for their attractive bloom. Easily grown in any garden soil in full sun or part shade. Many of the biennials and perennials will bloom the first year if started indoors in January or February. Sow thinly, 1/4" deep, to germinate in 9 - 12 days or more. 'MARSHMALLOW'. Soft pink, inch-wide flowers in clusters up the stems. Hardy perennial to 3 to 4 feet, with velvety, grey-green lobed leaves. E. Europe. Zone 3. The true Marshmallow has long been cultivated for the roots used medicinally and as food. Boiled, then fried with onions and butter, they are said to be a palatable dish, and the boiled leaves have also been eaten. 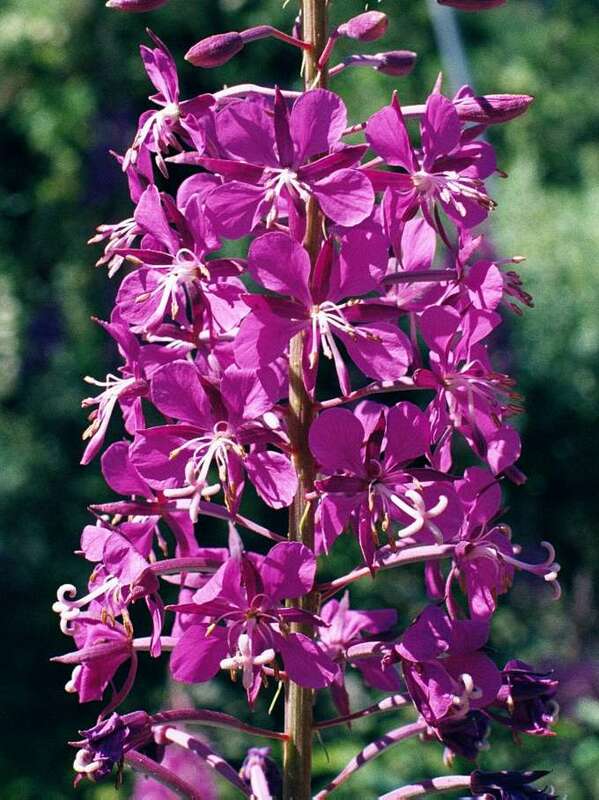 Mostly they are used medicinally for coughs, inflammations, etc., 'marshmallows' originally being a medicinal candy. It is said to be an immune system stimulant. Germinates in 1 - 4 weeks. 'GOBO', 'GREAT BURDOCK'. 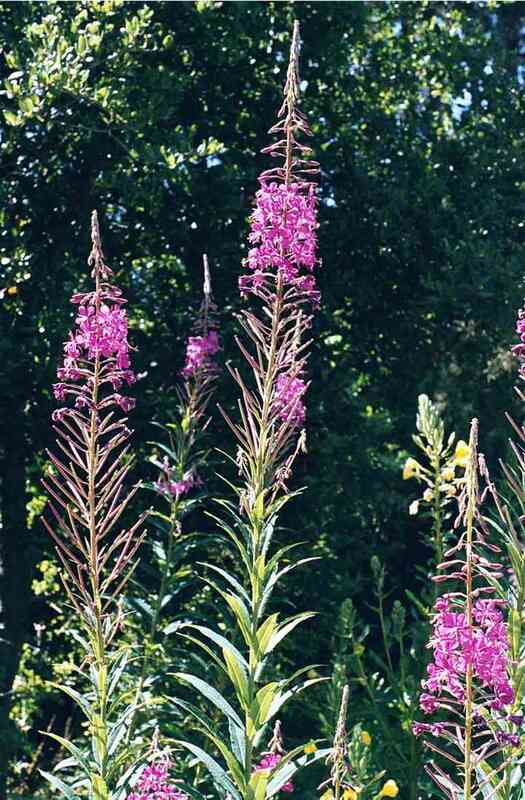 Giant hardy perennial to 10 feet, with purple-red 1 3/4" thistle-like flowers and large 20" leaves, white-woolly beneath. Eurasia. Often regarded as a 'weed' in the US, this is a popular vegetable in Japan. The young first-year roots are eaten, the young peeled shoots are eaten as an asparagus. Sow in deep rich soil in spring for a fall harvest, or in fall for spring crop. The seeds are an important medicine in Japan and China, and have antibiotic properties. Germinates in 1 - 2 weeks. CHENOPODIACEAE. 'SALTBUSH'. Herbs and shrubs with inconspicuous flowers, grown for edible greens, the handsome foliage, or as nutritious forage in arid regions. Salt tolerant, good for reclaiming saline soils. Easily grown in full sun. Germinates in 1 - 2 weeks, cool to warm temperatures. Seed viable 6 years. All hortensis varieties are also used in floral ornament both fresh and dried, and have been cultivated since the 1500s and 1600s. 'POT MARIGOLD', 'SOLIS SPONSA'. The wild form from Europe. Germinates in 1 - 5 weeks, sometimes part dormant, so 4 weeks prechill helps. Yellow and orange flowers. An early, potent, high yielding strain developed for the medicinal market. Striking fully double flowers with maroon petal-backs and faces in pastel pink shading to yellow in the center. Also called 'Zeolights'. Organically grown. CHENOPODIACEAE. Wide-ranging genus of mostly herbs with clustered tiny flowers. Many grown for ornament, edible greens or grain, aromatic culinary herbs or medicine. Easily grown and very useful. All germinate in 1 - 3 weeks unless noted otherwise. 'QUINOA'. An important high-protein (12 - 19%) grain of the Andes, with good amino acid balance and 58% starch. A staple for millions of Andeans, the development of low-elevation types is helping its spread. Seed washed in water before cooking to remove saponins which protect from pests. 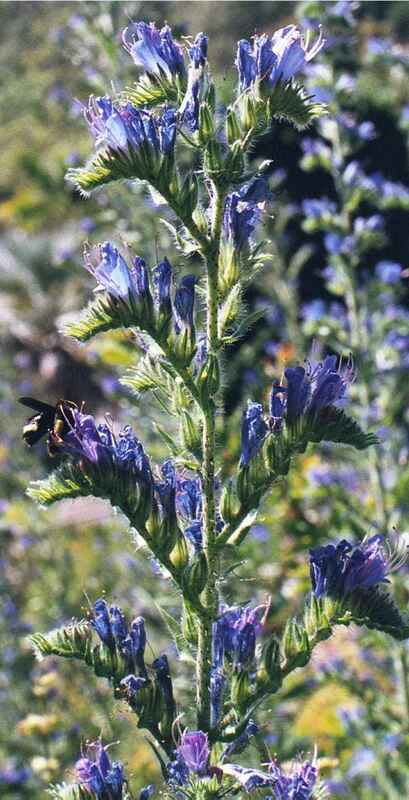 Hardy, easily grown annual to 4 - 6 feet, with large seedheads. The leaves, stem-tips and young flowers are excellent in salads, having a mild sweet flavor, and very succulent. Also good cooked like spinach or added to soups. Germinates in 1 - 2 weeks. 'FEVERFEW'. 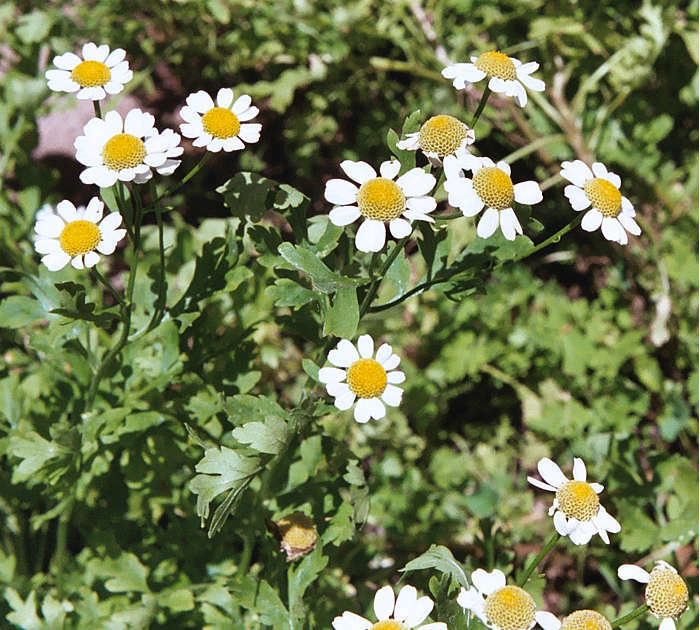 White 3/4" daisies with yellow centers, abundantly borne June to August. Bushy hardy perennial to 2 - 3 feet, with aromatic, deeply cut foliage. SE Europe. Zone 5. Blooms freely the first year, and is often grown as an annual. A fine old-fashioned garden plant, excellent for cut flowers. A tincture of the leaves is said to be an excellent insect repellant rubbed on the skin. Excellent remedy for migraine—I use it, it works! It made an amazing difference in my life. Germinates in 1 - 2 weeks. CANNABIDACEAE. Two species of twining dioecious vines, of easy cultivation. To save your own seed, plant several, to be sure of having both sexes. 'HOPS'. Hardy dioecious perennial twiner to 20 feet, with handsome 3-lobed leaves and rounded cone-like spikes which form the bitter 'hops' used to flavor beer and increase its intoxicating effects. Young shoots eaten like asparagus. North temperate regions. Zone 4. Prechill 6 - 8 weeks to germinate in 2 - 3 weeks. 'EXTRACT SAGE'. Developed for high oil content of the foliage for extraction. To 2 feet, lilac flowers, grey leaves. Germinates in 1 - 2 weeks. 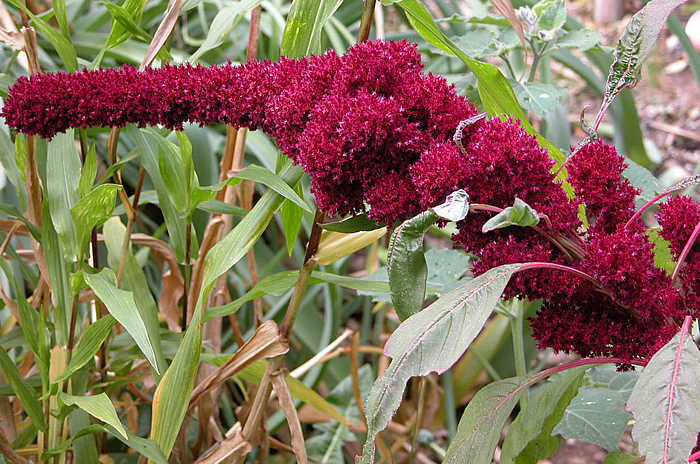 Amaranthus gangeticus. Huge maroon flowerheads with a long, trunk-like spike, resembling an elephant head. Robust 1 - 4 foot plants. Brought by German immigrants in the 1880s. Seed organically grown by Shoulder to Shoulder Farm. Germinates in 1 - 2 weeks. Ocimum Basilicum. Aromatic tender annuals grown in the herb garden for their value as seasoning and fragrance. The leaves are widely used in sauces and soups, the flavor blending particularly well with tomatoes. The clove-like fragrance has been considered soothing, and a cure for nervous headaches. Basil tea is said to calm an upset stomach. Start seed indoors 6 - 8 weeks before last frost, and plant out after all danger of frost is past. Thin to 6" apart. Basil likes full sun, and all types do well in pots. Harvest fresh leaves anytime. For drying, cut just before it reaches full bloom. Seed viable 8 - 10 years. Germinates in 1 - 4 weeks. Vigna unguiculata ssp. sesquipedalis. 'YARD-LONG BEAN', 'CHINESE LONG BEAN'. Very long slender green pods, reaching 15 - 30" but best for eating at 15". Red seeds. Cook like any green bean. Vigorous vines grow fast in warm climates, slower in cool areas. Organically grown. Small-seeded light colored beans bred for low tannin and sweet flavor. Re-selected by Alan Adesse to recover the best color and taste, Sweet Lorane can be eaten fresh like chickpeas or dried for soup. Very cold hardy and good nitrogen fixer. Organic. Cicer arietinum. A small, brown-seeded chick pea from India. Excellent for home gardens, good in dry, short-season areas. Not suited to cool coastal zones. Widely eaten in India fresh or dried, parched for snacks, ground into flour for sauces, pancakes, noodles, etc. An ancient snack food: Xenophanes, in the 6th century BC, spoke of "...drinking sweet wine and crunching chickpeas..."
Heirloom pole bean with bright yellow flat pods. Best picked at 6 - 7" long for tender delicious snap beans. Large vigorous plants with heavy yields. Beautiful red-podded snap bean from Nestos, Greece. Early and productive, rare in the U.S. The dry beans are shades of buff, pink, lavender, purple. Great for both fresh snap beans or dried for soup beans. Long slender bright green pods, mature beans pretty brown and white, keeping their color after cooking. Bush type. Organically grown. Very tasty stringless rosy-purple snap beans. Bushy compact plants with pretty white and coral-pink bicolored flowers. A cross between pinto beans and a purple snap variety, bred by long-time Seed Saver's Exchange member Robert Lobitz. Family heirloom from the Willamette Valley in Oregon, this is a dry bean for soups and stews. Beans are dark purple-red with white markings, and incredibly flavorful. Bushy plants with an occasional runner. Organically grown. Unusual Scottish heirloom grown for the abundant long narrow leaves, which are deep violet-red with a distinctive metallic sheen. More tender than other beet or chard greens, makes terrific baby salad greens. Organically grown. Bred by Alan Kapuler, a cross of Lutz Overwintering, Crosby Purple Egyptian, and Yellow Intermediate Mangle. Produces beets of varied shapes and sizes, in red, pink, and orange, all sweet and tender. Excellent for greens, too. "Question with boldness even the existence of God; because if there be one, He must approve the homage of Reason rather than that of blindfolded fear. "—Thomas Jefferson. Deep purple skin, pale yellow to white inside, with strong, spicy carrot flavor. Delicious roasted, creamed, or sliced thin for salads. Similar to the black carrots that arrived in Spain from North Africa in the 1300s. Organically grown. Tall green stalks blushed deep red, with rosy-yellow hearts. More flavorful than green celery. Cold hardy. Organically grown. Broad deep green leaves with white veins. Lots of flavor. An improved Vates type, slow bolting, stands 2 weeks longer than other collards. Flavor is richer and sweeter after frost. Nutritious addition to stews and soups, or braised with olive oil and garlic. Organically grown. Colorful tasty heirloom with large ruffled blue-green leaves with purple veins and stems. Grown for over 100 years by the Blackwell family in Alabama. Makes pretty baby salad greens, and great sauerkraut and curtido. Wonderful sweet corn, kernels creamy yellow in the milk stage for fresh eating, maturing deep purple-black when dry. Fairly early, good in northern areas. Bred by Edwin Meader in 1978. Organic. Popcorns are smaller than other types, and are harvested after the cobs have dried on the stalks. Valued for its ability to pop when heated, it has been regarded as a festive food since ancient times. Heirloom grown since the 1880s, with melt-in-your-mouth tenderness and rich flavor—absolutely one of the best-tasting popcorns you can find. Plump white kernels on 4 - 6" ears. In Italy, popcorn is ground for meal, and this variety makes especially good white polenta. Organic seed. Miniature French type with narrow, finely-curled leaves and creamy hearts. Mild sweet flavor, excellent for baby salad greens. Huge tall plants with bright green leaves surrounding golden hearts. Thick, sweet, crunchy inner leaves for salads, outer leaves for braising or roasting with chicken, beef, or pork. Organically grown. Another diverse gene pool from Wild Garden Seed, begun by crossing Siberian and Red Russian, it now produces a wide variety of leaf types colors, all developed for summer sowing, fall harvest, and overwintering in mild climates. 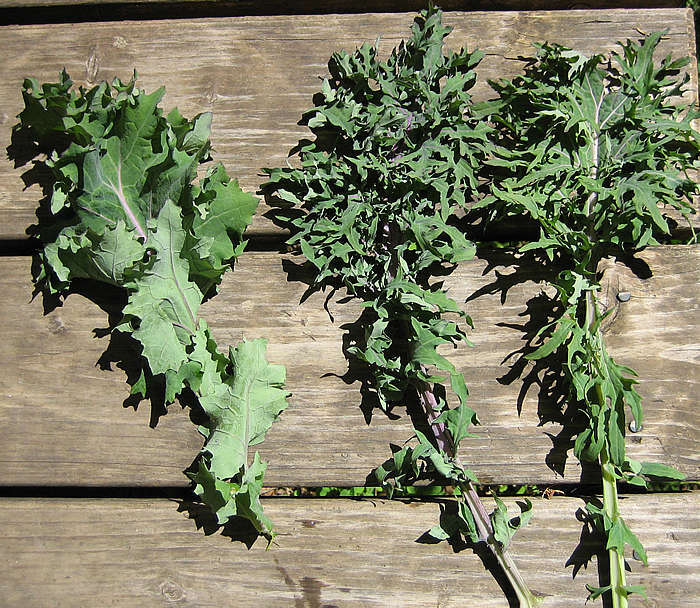 All are sweet and tender, not as strong-tasting as European kales. 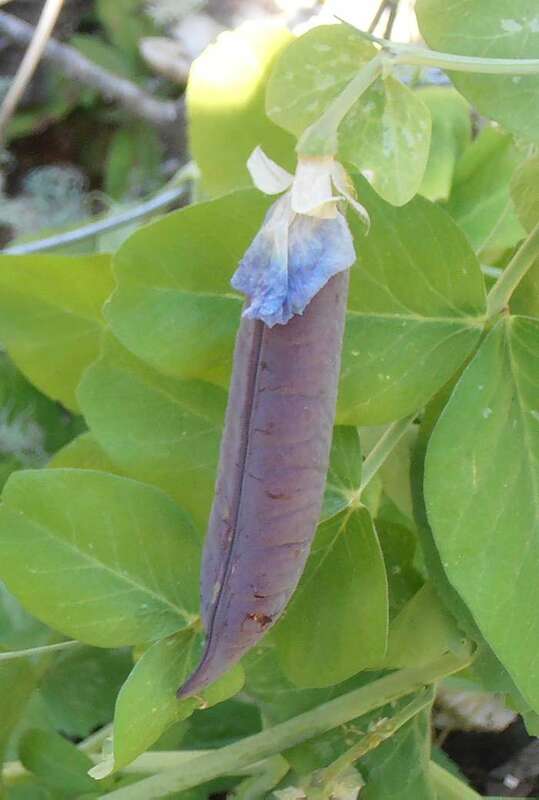 French heirloom from the 1800s, with large sweet-flavored stalks and blue-green leaves that turn vivid violet in cold weather. Extremely hardy, excellent in short-season areas, sown in early summer for winter harvest. Organic. Another genetic blend from Frank Morton at Wild Garden Seeds, this is a mix of dense-heading small-leaf 'Gem' types in many colors, often streaked or spotted. Small 'personal-sized' heads, with hearts of wine-red, rose, amber, or butter yellow. Organic. Extraordinary color in a mustard—in cold weather the lobed leaves turn a deep, dark violet with vivid magenta-pink veins and sterns. Color like no other! Mild flavor, perfect for winter salads. From Frank Morton of Wild Garden Seeds. Organic. C. pepo. Originally from Styria in Austria, grown for the hulless seeds, which are a nutritious snack, and pressed for an excellent cooking oil. The flesh can be cooked for soup or pies, but this type is mainly grown for the seeds. Organic. This salad mix has quite a back-story. In 1994 Frank Morton's Outredgeous was the first lettuce grown in space—NASA chose it for the International Space Station. Frank worked with NASA scientists to create this mix, based on fast growth and high nutritional content. Contains Outredgeous and Jester lettuces, Red Ursa kale, Green Velvet and Triple Purple oraches, Persian Cress, and Vivid Choi mustard. The salad mix of astronauts and cosmonauts—try it with a glass of Tang! Organic. C. maxima. Rare heirloom Hubbard-type squash, oblong with slate-grey rind, slightly ribbed. Golden yellow flesh, sweet and dry, very dense. Prized for its excellent flavor. Averages 20 pounds, and can reach 40 pounds. Stores well. This variety was popular with market growers in the Yakima Valley, Washington, in the late 1800s, where they sold cut pieces of the large squash. Organic. Introduced by Burgess Seed Co. in 1950, compact plants produce an abundant early crop of round, deep pink, medium-sized fruits with excellent tomato flavor. Perfect for container growing and short-season areas. Organic.